Samoa claimed the Dubai Sevens crown as they upset reigning HSBC Sevens World Series champions New Zealand in the final on Saturday. The Kiwis suffered a second shock of the day, after the All Blacks were rocked by England at Twickenham, as Gordon Tietjens' Sevens side lost 26-15 to Samoa. Paul Perez scored two early tries to put Samoa 12-0 up before the Kiwis fought back with tries from Ben Lam and captain DJ Forbes. 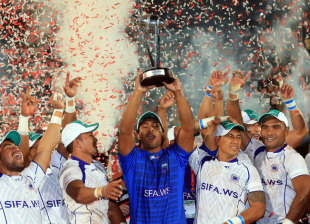 Lio Lolo struck for Samoa prior to the break before Kurt Baker reduced the deficit again but Tulolo Tulolo rounded off Samoa first victory in Dubai having made the final in 2010 and 2009. In the semi-finals Samoa had overcome France, who had pulled off the shock of the tournament by beating Fiji in the quarter finals, and New Zealand had beaten Kenya 27-7. England ended a disappointing tournament by beating Spain 26-5 in the Shield final with Marcus Watson scoring twice. Ben Ryan's men had been knocked out of the Cup competition on day one and then the Bowl competition on day two with a 24-14 defeat to Argentina. Wales beat Canada 21-14 in the Plate final with James Davies scoring twice after the Dragons had overcome Fiji in the semi-final with Rhys Jones scoring 17 points, including a hat-trick of tries.